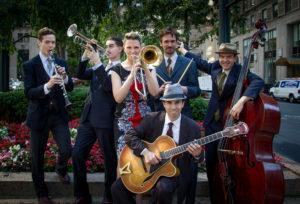 Straight from New York City to Indy’s District Theatre Emily Asher‘s Garden Party Quartet brings a full, two-set program of freshly arranged tunes from the Hoagy Carmichael Songbook along with her new program: Swingtime in the Garden. The band delights audiences of all ages with Asher‘s tenacious trombone and sweet vocals, Mike Davis’s virtuosic trumpet playing, Rob Adkins swinging bass lines and Adam Moezinia’s Juilliard-honed guitar mastery. Come hear this versatile group from NYC’s vibrant early jazz scene bring Hoagy back home again in Indiana to The District Theatre.